February 7, 2019, New Minas, Nova Scotia . 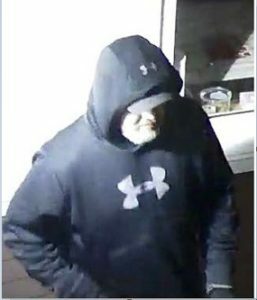 . . At 12:45 a.m. on February 6, New Minas RCMP responded to a Break and Enter at a veterinary clinic on Commercial St. in New Minas. Surveillance footage shows a man wearing gloves and a dark coloured hoodie using a tool to pry the door open. The man entered the building, then ran from the scene and left the area in a vehicle, headed down Commercial St. Police suspect the very loud audible alarm in the building caused him to reconsider his intentions. Nothing was stolen and Kings District RCMP are investigating the matter. Anyone with information is asked to contact the RCMP at 902-679-5555. Should you wish to remain anonymous, call Nova Scotia Crime Stoppers toll free at 1-800-222-TIPS (8477), submit a secure web tip at www.crimestoppers.ns.ca, or use the P3 Tips App.